If you’ve been waiting for the perfect time to turn a spare room into a home theater, now is the time! 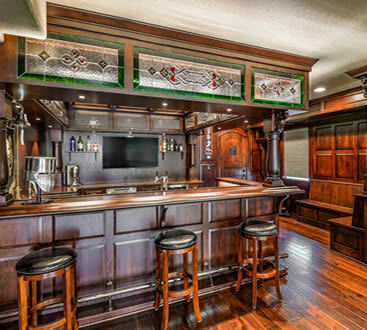 At The Artisan Shop in Loveland, our cabinetry professionals have helped hundreds of customers design and build custom cabinetry for their home entertainment centers. While the process is very exciting, it is also very complex, which is why we’ve compiled the first basic steps you should take before building the perfect home theater. First and foremost, it’s vital to get an idea of how much you are willing to spend on customizing your new home theater. Do you want a home theater with a huge flat screen TV? Surround sound system? Reclining chairs? Custom cabinetry? While there are several things to consider before taking the plunge, decide on your must-haves before starting reconstruction. When it comes to designing your home theater, speaker placement is very important. The average entertainment center has five full-range speakers and one woofer, to create an amazing surround sound experience. All speakers should be close to ear height when seated, and they should be a good twenty inches from the wall. If you’re looking for a unique and personalized addition to your new home theater, custom cabinets can be created to perfectly fit in your desired space. At The Artisan Shop, we’re passionate about providing the best in hand-crafted custom cabinets to clients throughout Colorado. Our experienced designers and artisans can transform raw materials of your choice into beautiful, award winning projects. If you’re interested in learning more about our locally owned and operated team of cabinet professionals, contact The Artisan Shop today and let us help make your home theater dream a reality.